Tacitus' narrative of 69 CE, the year of the four emperors, is famous for its description of a series of coups that sees one man after another crowned. 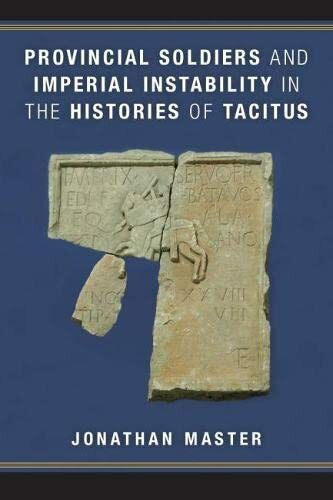 Many scholars seem to read Tacitus as though he wrote only about the constricted world of imperial Rome and the machinations of emperors, courtiers, and victims of the principate; even recent work on the Histories either passes over or lightly touches upon civil unrest and revolts in the provinces. In Provincial Soldiers and Imperial Instability in the Histories of Tacitus, Jonathan Master looks beyond imperial politics and finds threats to the Empire's stability among unassimilated foreign subjects who were made to fight in the Roman army. Master draws on scholarship in political theory, Latin historiography, Roman history, and ethnic identity to demonstrate how Tacitus presented to his contemporary audience in Trajanic Rome the dangerous consequences of the city's failure to reward and incorporate its provincial subjects. Master argues that Tacitus' presentation of the Vitellian and Flavian armies, and especially the Batavian auxiliary soldiers, reflects a central lesson of the Histories: the Empire's exploitation of provincial manpower (increasingly the majority of all soldiers under Roman banners) while offering little in return, set the stage for civil wars and ultimately the separatist Batavian revolt.